Costa Cruise Line, a 65-year veteran cruise line, has always been one of my favorites. One of the very first cruises I ever sailed on – long before I began writing about sea-going vacations – was Costa Flavia. Somewhere in the 1960s my husband and I, along with another couple, sailed to Nassau on a three- or four-day cruise. I loved the entire Italian-accented experience…the waitstaff dressed as Venetian gondoliers, the music, the food, the atmosphere – it was a trip! Since then I’ve attended several Costa ship-naming ceremonies, been on Caribbean inaugural sailings and, about 20 years ago did a repositioning cruise from South Florida to Europe. It was a marvelous crossing on the charming Costa Romantica, (now the neoRomantica, after a fairly complete rehab) and it was glorious. Fortuitously, we were upgraded to a magnificent suite and, truth be told, it was wonderful. A maitre’d on that sailing taught us to make one of the most simple and delicious pastas ever, something I still toss together from time to time. Sauté diced onion, garlic and chili pepper flakes in olive oil, pour over any type of cooked pasta and mangia! An easy and absolutely delicious memento of a cruise. The Mediterranea debuted 11 years ago as an elegant Italian palace with all the marble, gilt and rococo elements one can imagine. The 85,000-ton ship has 1,057 cabins (781 with balconies) with a generally colorful décor that utilizes Carrara marble, Murano glass and varieties of inlaid wood throughout the ship. Joe Farcus’ designs include the Maschera d”Argento Atrium with a dramatic 80-foot high installation entitled “Danze” featuring 25 figures. 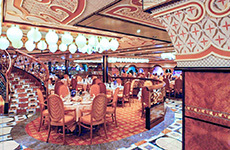 The ship definitely features a strong Italian style and is international in feel. Announcements are made in Italian, English, French, Spanish and German. The ship will spend the winter and early spring in the Caribbean. Although Costa sails to more than 250 destinations and 69 ports worldwide, this new multi-island innovative itinerary makes it even more international. Sailing from PortMiami, the vessel offers an unusual itinerary: Nassau in the Bahamas, Samana in the Dominican Republic, Tortola in the British Virgin Islands, St. John’s, Antigua, Guadeloupe, St. Maarten, (the Dutch side of the island) and Freeport, the Bahamas. Many Europeans, the mainstay of Costa’s guest lists, remained on after crossing from Europe late last fall to experience these new ports of call. Three sea days also have their appeal for those who want to spend time in the spa or at the pool, or just sit on deck enjoying the latest bestseller. 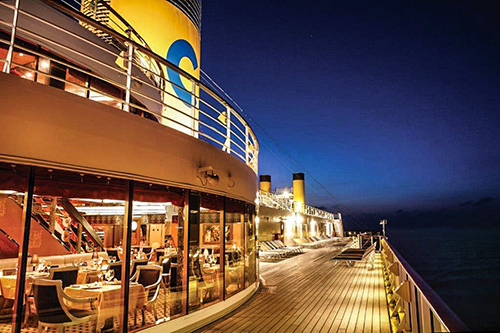 Costa varies the itinerary slightly with 10 – and 12-day sailings to other ports. I sailed the above itinerary, which offered a wonderful taste of the Caribbean that attracted many international travelers. A quick glimpse of it is below. 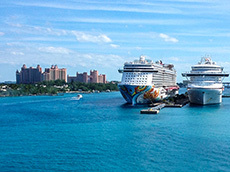 Nassau was our first port of call after sailing from Miami. 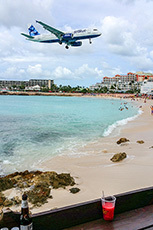 Many passengers headed out to Atlantis, the gigantic entertainment complex on Paradise Island. Europeans seem to know all about the island: the outstanding aquarium, water park, casino and restaurants. It was the shore excursion of choice for many aboard the vessel. Of course, Nassau is much, much more. Nassau is the Bahamas’ capital and sits on the northern side of New Providence Island. In 1666 the British made it their second Caribbean island and there remains a distinct British feel to the island. Don’t miss the restored Fort Charlotte, which although it has never seen battle, is still impressive and offers wonderful views of the island. See Queen Victoria’s monogram on the cannons at the 18th century fort. Climb the Queen’s Staircase or shop on world-famous Bay Street. Snorkel, dive or swim in the ocean. Choices are many. Samana – pronounced sah-mah-NAH – is a peninsula of the Dominican Republic, a nation sharing the island of Hispaniola with Haiti. Costa Mediterranea tenders into the small town and a tour passes several outstanding old churches, wonderful lush countryside with mountains looming nearby, and a dramatic mix of real poverty and wealth. 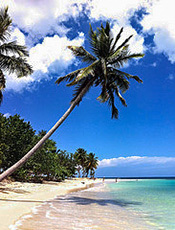 Samana is the capital of Santa Barbara Province and was discovered by Columbus in January 1493. A few years ago a bridge connected Samana to the capital, Santo Domingo, increasing tourism to the area. A charming Whale Museum documents the annual migration of the Hump Back whales to the Samana Peninsula. Tours include visits to the mountains, an off-road adventure into the interior or a cave and mangrove exploration. Foliage on the island is lush. Shopping stops are scheduled on most tours. Tortola is the capital of the British Virgin Islands and a charming tourist destination with magnificent white sand beaches, charming shops and wonderful water experiences. Consider a ferry ride across the Sir Francis Drake Channel to Spanish Town, where a safari bus takes guests to the marvelous Baths on Virgin Gorda, a collection of large granite boulders and grottos. Swimming among them is a delight. Explore old ruins or look into other tours, including a safari bus adventure that offers a nature walk in Sage Mountain National Park, a chance to sail or take a great beach break. The turquoise waters of the British Virgin Islands have long been a draw of fisherman, boaters and tourists who just want to enjoy a quiet beach. Tortola is the largest island in BVI chain. Located in the British Leeward Islands, Antigua is best known for its 365 beaches – one, islanders will tell you, for every day in the year. The beaches are delightful, but the island’s vegetation is also notable. Pineapple groves, banana trees, and amazing rain forests dot the island. 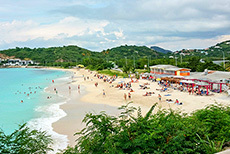 The largest island in the British Leewards, Antigua has a smaller sister island, Barbuda. For centuries was fought over by Spain, France, Holland and Great Britain, Antigua is home to Nelson’s Dockyard (obviously, Great Britain won) a local site not to be missed. Lord Horatio Nelson arrived at English Harbour in 1784 and it’s worthwhile visiting the Admiral’s House, and other buildings. Queen Elizabeth rested at nearby Clarence House in the mid-1980s. Up in the Shirley Heights Lookout you’ll find the proverbial bird’s-eye view of the island. Guadeloupe, a French overseas department, meshes French, Indian, West Indian and African cultures in its cuisine, design and lifestyle. (Think Madras plaid, creole cooking and croissants.) English is spoken widely, but expect to hear a local patois mixing all the cultures who have contributed to the island. Nature is front and center on the dual islands that form Guadeloupe: Grande Terre on the Atlantic side and Basse Terre on the Carribean. Grande Terre, the eastern wing of island, is home to sheltered white sand beaches and rocky cliffs. On Basse Terre, La Soufriere (almost 5,000 feet high,) houses the elegant 74,000-acre Parc National featuring waterfall-fed swimming pools and gardens. Pointe-a-Pitre is the island’s port on Grande Terre. Tours include a chance at kayaking and snorkeling, and a bus tour to beautiful Carbet Falls. Costa Mediterranea docks in Dutch St. Maarten, the smallest land mass in the world housing two governments: French and Dutch. 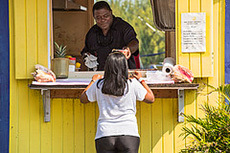 Many tourists head to a nearby casino while others take a shuttle and spend time in Marigot, on the island’s French side, or catch a ferry from Marigot to beautiful Anguilla. Others aim for a local beach. There’s a chance to do a lagoon eco-kayak trip, a Harley Davidson tour or participate in an “America’s Cup” regatta. For many veteran travelers, shopping is the sport du jour, with jewelry and fragrance the big attractions. This island – less than 90 miles east of Fort Lauderdale – was created in the 1960s as a beach, gambling and shopping destinations. Traces of old Bahamian settlements can be found in tiny fishing villages away from the tourist hot spots. Many tourists wind up buying a day pass to the Lucayan Beach Hotel for $15 and then spend the day at the beach or poolside. Changing rooms are available. In late December, sister ship Costa Luminosa joined the party out of PortMiami. 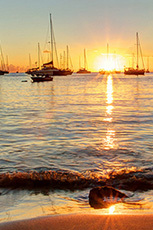 The vessel visits Jamaica, Mexico, the Cayman Islands, Bahamas and Turks and Caicos on a series of 10-night cruises. Luminosa debuted in 2009 and was the first in a new class of ships for the line. 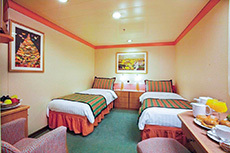 The vessel also has a high percentage of cabins with balconies.